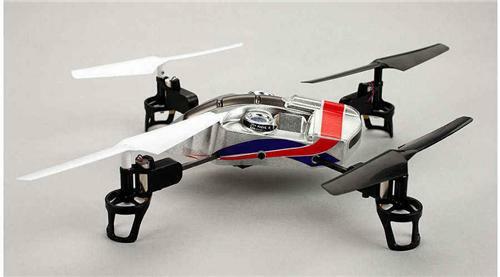 Here you have an E-Flite BLH7580 Blade MQX BIND & FLY Ultra Micro Electric Quad Copter !! This package will include the Heli, 3.7 Volt 500Mah Li-po Battery Pack, Charger, Wall Adapter And Owners Manual. You can simply bind this Heli to any New Version 4 to 7 Channel Specktrum Series or Jr Transmitter and you have another complete heli ready to fly !! Please understand that this sale includes the complete ARF E-Flite Quad-Copter Heli, Original Battery Pack, Charger, Wall Adapter, Owners Manual And Original Protective Storage Box. Why bother with buying another transmitter if you already have one and don't need it ? This way you can bind this new heli to any one of the New Version Spektrum Series Transmitters, charge & install onboard battery pack and you are up and flying !!!! While one of your heli's is out of commission needing repairs, you have another !! Ii will also include the Original Quad-copter Owners Manual so that you can refer to it if you need it for the binding process !! You can't go wrong here when you will receive an E-Flite heli, you have a Low Purchase Price Of Only $119.99 and if you buy it now you can receive it in just a "few days" !!! This is an all new direct replacement Teriffic Heli so BUY NOW at this Blowout Price or Loose Out !! OK, so Thank You For Looking At My Item And Please check my other "BUY IT NOW OFFERS" for More Heli's, Parts, Upgrades, Accessories And Many More Specials !! It’s sleek. It’s high-tech. It’s an RC flying experience unlike any other. It’s the exciting Blade® mQX; the world’s first quad-copter equipped with the advanced AS3X™ (Artificial Stabilization in 3 Axis) System. The sense of precise control this system gives an mQX pilot rivals that of bigger quad-copters that cost a whole lot more. Indoors or out, breezy conditions or calm, you’ll find you can fly the mQX with complete confidence just about anywhere, anytime. And it’s so simple to set up, anyone with experience flying conventional RC helis will find it’s the perfect introduction to quad-copter fun.